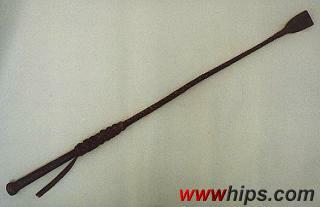 Steel core riding crop from Pakistan. A thin, flexible steel rod is first tapered by putting some filler (leather or paper) around, then completely braided with leather. This is the "high-end" version with some fancywork, looks impressive as a wall decoration.